It's been a whirlwind year for recent nursing graduate Anna Simone, N'15. After graduating last August with a BSN and a college career in track and field in her pocket, she made the crucial decision to apply to Altis, training ground for the Olympics. The Mt. 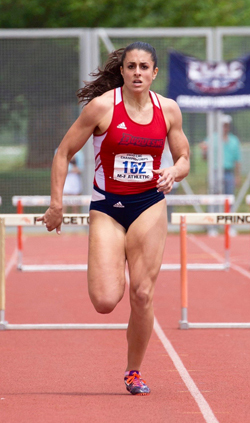 Lebanon, Pa. native was accepted and is currently living on Altis' Phoenix, Arizona campus--eating, breathing, and living to qualify for the 400 meter and 400 meter hurdle events this summer. She trains six days a week, up to six hours a day, follows the counsel of her four head coaches and is running her fastest times ever. She follows a strict diet of vegetables, fruit, and fish, reporting that her body is "responding in crazy ways. I'm getting leaner day by day, and I'm running my best times." Anna is also simultaneously looking to create opportunities for herself by seeking Italian citizenship in the hopes of representing their Olympic team. At Altis, each athlete is surrounded by a supportive staff and Anna is encouraged by her fellow runners, all seeking a place on the world stage. She has been humbled by her professional training, living and working with an incredibly diverse and international set of colleagues who she learns from every single day. When asked where her strength and discipline originate, Anna states, "Duquesne University taught me many lessons and exposed me to countless life experiences, but without a doubt, the support system Duquesne provided me with--in both Athletics and Nursing--is the number one reason I further adopted a "leader" personality. I'm the youngest of five siblings, and since I was very young, I have always wanted to be a leader in everything I do; but without the right people behind you, such a task can seem unattainable. My loving and incomparable parents and my Duquesne coaches, along with my professors in the classroom, made me the leader I am today--through their overwhelming confidence in me. I truly believe that I could not have found that amount of encouragement at any other institution. I am so fortunate to have attended such an uplifting and self-empowering alma mater as Duquesne University." Simone finished her career at Duquesne holding six school records and winning nine Atlantic 10 medals. She qualified for the NCAA East Regionals three times and ECAC Qualifiers five times. Watch and learn about Anna's time at Duquesne and follow her on Instagram and Twitter.